One of the more interesting presentations at the 2017 American Dream conference was by Alain Bertaud, a French demographer currently working at New York University. He has compared urban areas all over the world to see how transportation has influenced the layout of those areas. He started by comparing Atlanta with Barcelona, Spain. Although both have about the same number of people, Barcelona occupies about 63 square miles while Atlanta covers 1,650 square miles. Barcelona has about 62 miles of rail lines, while Atlanta had about 46 when Bertaud was making his comparison (it’s up to 52 today). 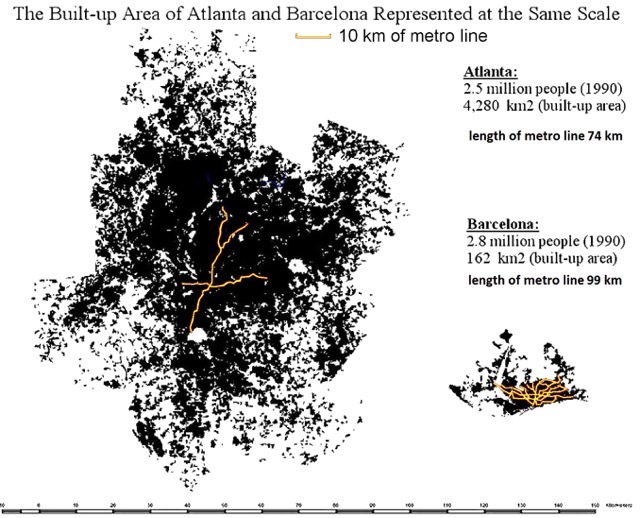 In order for Atlanta’s rail system to provide the same level of service to its residents as Barcelona’s, the region would need to build another 2,350 miles of rail lines. At current construction prices, that would cost at least $700 billion. 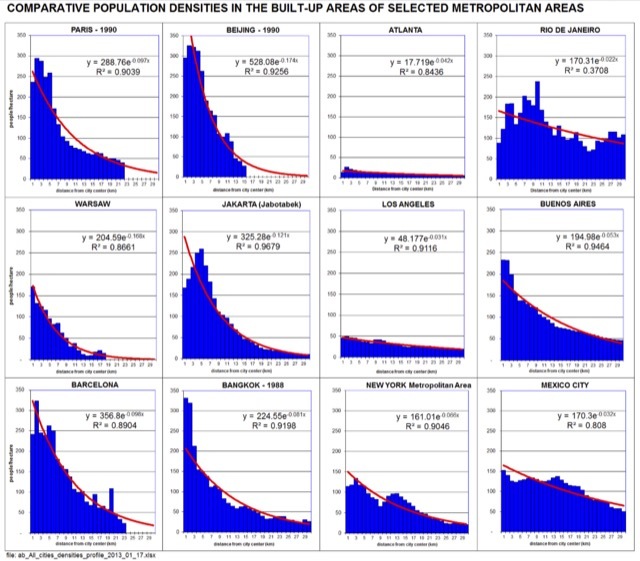 The above charts show population densities within 30 kilometers of urban centers, with the first kilometer on the left and the 30th kilometer on the right. The European cities, including Paris, Warsaw, and Barcelona, shown in the first column, are very dense in the center with densities falling to nothing after 22 miles from the center. Asian cities in the second column–Beijing, Jakarta, and Bangkok–are similar. But American cities in the third column–Atlanta, Los Angeles, and New York–look very different. Densities do taper off but the centers, even of New York, are nowhere near as dense as in Europe and Asia. 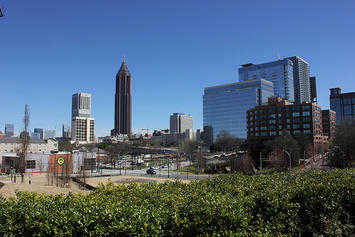 Moreover, Atlanta’s population growth in the 1990s was mostly in the outlying areas. 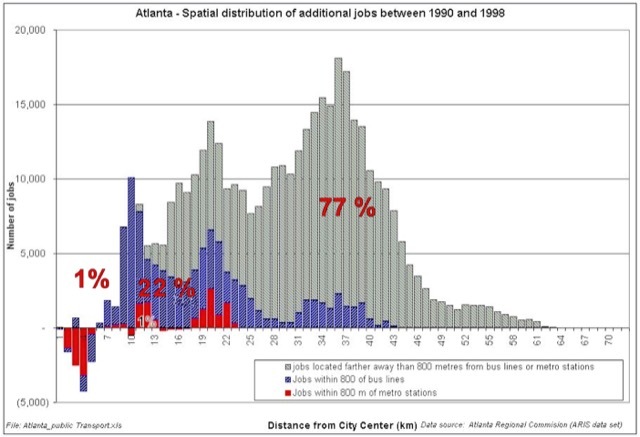 Only 2 percent of new Atlanta residents located within a half mile of a rail station and only 13 percent located within a half mile of a bus stop, while 85 percent located more than half mile from either. Even as American urban planners, particularly on the West Coast, try to make our cities more like European ones, European and Asian cities are becoming more like American ones. 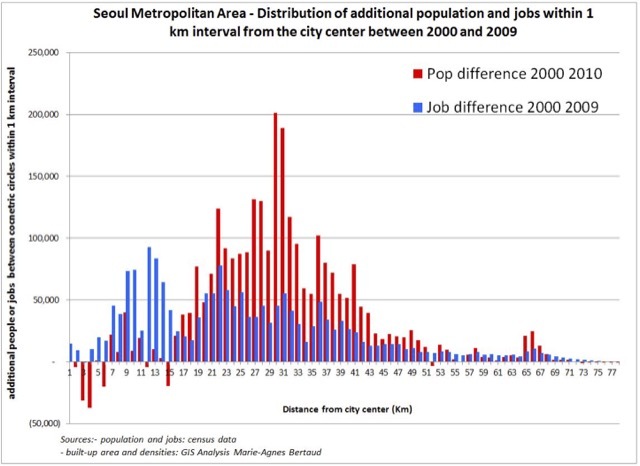 In Seoul, for example, most population growth was in the bands between 20 and 40 kilometers from the center, while most job growth was in the bands between 9 and 35 kilometers from the center. The same is true for European cities. While the second chart shown above makes it appear that Paris and other cities are monocentric, in fact they have large numbers of suburban jobs. 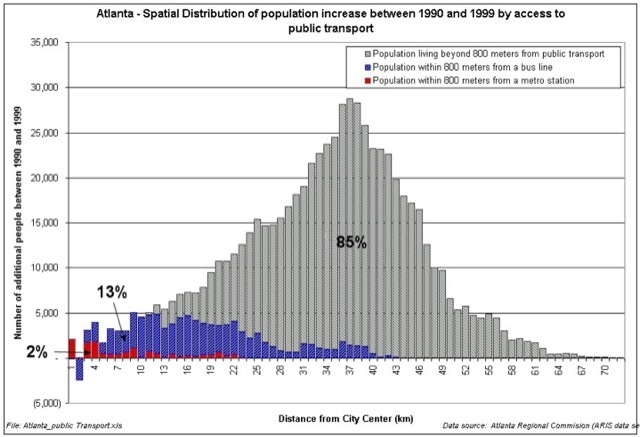 As Bertaud noted, “Even in metropolitan area like Paris, with an elaborate transit system, the majority of trips are made by cars from suburb to suburb.” Transit ridership in many European cities is flat or declining, while driving is rapidly growing. When new technologies like automobiles change the shape of cities, there is no going back. Cities can build rail lines, subsidize dense housing projects, and try to discourage driving, but driving will continue to grow even as transit ridership stagnates, at best, and per capita ridership falls. Photo by Nicolas Henderson, via Flickr, using CC License.